The battlefield: the canals of old Torktuga. De Hombres Rojas at the top. Baywatch Gang bottom. Black Mab's Crew are off right somewhere. The Baywatch Gang grabbed the girl and ran, but failed a rout test before they could escape. Black Mab wins. The Moor was captured by Black Mab and sold into slavery. The crew found a Dropped Satchel with 1gc in it. For this take we finally rolled a feisty daughter... Even though she looked a lot like the timid daughter. We have been playing this scenario since 2009, really! So are most of the Baywatch. However, the Baywatch are favored by the daughter's whimsical movement (again). Cat-o-nine tails and a sword were stolen from Al Bobo. Gunner Harvey was captured by the Crew. We lost his blunderbuss and sword. And that 2nd Governor’s daughter was a mean brat! Hadj was captured by The Crew and sold into slavery. Princess Alma (cabin girl) fully recovered. (No relation to the Governor). HURRAH! A return to the Caribbean; my second favorite campaign locale. OH BABY! Oooh, I look forward to following this one! Good looking warbands, very impressive scenery... I suspect this might turn a bit epic as well. & am I mistaken, or did that Governor's Daughter used to sulk at Bretonnian jousting competitions? @Rhydderch--I think she is a frenzied mob model. She features in a couple of award winning dioramas if I recall correctly. All battles have taken place in the Pyrate Port of Torktuga as the pyrates are loathe to try guns of the Port Sigmar Shore Patrol (and can roll higher than the dwarfs at least when choosing location). Drunken pyrates blunder into drunken dwarfs with crossbows in Torktuga's streets. Kabala the Colossus (a pyrate mate) is killed by the Trickshooter. The pyrates' black powder weapons are ineffective and they flee again. No dwarf goes out of action. No dwarf is promoted either. The Pyrates of Saturdayheim gain a hero for their struggles. The battlefield a few turns on. Despite having a 36" range with crossbows the dwarfs elect to close to 24" range before attacking the smugglers or the Watch. The speedy pyrates close on the smugglers. But a crossbow bolt startles the invisible crowd, who trample the T3 pyrates. Someone planted all these palms in the middle of the street. The first pyrate aboard meets a sorry end. Then the pyrates grab a crate and start to carry it away. Lads Got Talent Flynn gets knocked into the water. The Bay Watch flee with 2 heroes and 3 henchmen out of action. They capture one cargo crate which turns out to have 2 gc worth of food AND a hidden dose of Crimson Shade. Somehow the pyrates manage to capture one of Mrs Wolfgang's victims. He is pressganged. Mrs. Wolfgang was outstanding tonight. Cabin Boy Little Billie, got Old Battle Wound. At 4 exp. he has +1Ld and +1I. so I fired him. L.G.T. Flynn, must miss the next game. Hired another Gunner but could not find a blunderbuss. Bay Watch Gang now has 11 members and 118 warband rating. The Smugglers fight to the last man. For all their shooting, the dwarfs eventually are forced to board the ship and kill the Smuggler Captain to win. The Dwarfs gain 6 cargo crates from the ship and others in exploration. They confiscate (steal) mainly food, booze and clothing. A Thunderer becomes the fifth hero. None die. No one dies (a shock considering how many warriors were out of action this week). Mab finds unguarded gunpowder while des Hombres claim a crate of pocket pistols off the docks. Des Hombres gain LOTS of gold for once. Not that many Pirates can boast surviving being eaten by a Croc. COOL game & everyone was painted...OH BABY! There's a real anarchic element to your games/campaigns, you know that? Siren songs & pirate-gobbling crocodiles & all. It makes even the simplest seeming of battle reports into something ever surprising & very fun to read! I love your docks and piers- great place for a game of Mordheim. Thank you for all the kind comments gents. This week Chris was out of town. So Jake's dwarfs beat up on the two Jims in the scenario Pressgang. The Bay Watch right is right around the corner. The Engineer trips before he can accost the nearest drunk. Mrs Wolfgang claims the first drunk. She also triggers the panicked invisible crowd. The Battle of the Dogs is fought by Des Hombres. The Bay Watch flee with the Captain and two other heroes out of action (along with 3 crew). The Bay Watch Gang captured like one drunk... Anne Bonny suffers a Chest Wound, but no one dies. The Watch had three heroes standing when they ran, but complain of horrible exploration anyway (because, like, they made the most money, but fail to find that blunderbuss again). Des Hombres captured two drunks and killed one angry drunk and 4 dogs... No Hombres died. But only one hero was still standing when it was time to run. The White Dwarfs roll poorly but gain 50 gold from a lucky exploration find in addition to the 35gc they gain normally (I think they didn't roll enough dice or something). They captured 2 drunks and killed one as well. The lone hero to fall is Hardened. The Vertically Challenged Ones are really splendid miniatures; it is a shame they will probably never see any paint other than white. The Dwarfs raced des Hombres through a dark night to grab more unsuspecting drunks off the streets of Port Sigmar. It was the first game of the campaign fought in Port Sigmar, so we butchered all of the special rules for the port. The dwarfs won anyway by pummeling the men of Estalia into fleeing. The more fleet men grabbed four drunks and killed one. The dwarfs killed two and captured one drunk. One dwarf fell captive to the Estalians. Gunnar Gunnison saw the advantages of joining the crew rather than walking the plank, so des Hombres gained a dwarf! Almah the Merchant Princess lost a pit fight after being cut down by a Troll Slayer. The Troll Slayer became frenzied.... Despite suffering 4 or more casualties during the fight, des Hombres lost no one. Des Hombres Rojas hire a Big Game Hunter (which was the reason for coming to Port Sigmar.) The dwarfs fail to find Dwarf Axes despite searching with all heroes who could. Despite the handicap of darkness, the humans reached their ship and loaded the treasure safely. Ha! Des Hombres win a game! (Once again a variety of special rules were ignored or forgotten or both....including the fact that des Hombres failed a Pirate Curse roll....) The treasure chest contained about 20 gold and that was it, but no one died. The Gunner Gomez y Gomez became a hero and was gifted with a nice new blunderbuss. Almah recovered from another injury and the Hunter did as well. Mab's Crew vie for drunks with des Hombres. There were nine drunks. Three joined The Crew willingly (it helps to have women pirates running the pressgang.) Des Hombres subdued 5 (including 3 angry drunks) and killed one. Mab's crew showed fight, but grew demoralized by many failures to climb, jump or dive. The Crew fled as soon as they could with another five or so down. Only one died this time. Despite the lack of photos, it was an exciting series of adventures. OUTSTANDING NARRATIVE! Kevin's Marienburgers occupied a building in the center of the 'land' table edge rather than a corner since the pyrates were already entrenched in the corners of the table. The Marienburgers shot at the handgunner, missed and set off the panicked (but invisible) crowd of dockside merchants, pirates and the like, who trample the fellas behind the handgunner. Gunner Ernesto de Garza takes cover behind the squid and lobster crates. The 4 way fight became 2 one on one battles as Kevin shot Jim L up and Chris dodged my Tilean's shots (poorly 3 crew out of action in two shots...) Chris rolls the event Security Measures which causes one of the crates in my possession to blow up! The Bay Watch Captain defeats Guido the Tilean (body not pictured). The Mary Ann's fled first. One of their warriors was captured by the Bay Watch. Mary Ann's gain +3 underdog bonus in their first game. The Mary Anns also capture a Drunken Lubber in exploration. Mab's Crew fled next. One pyrate died. One was captured but refused to join Des Hombres crew. Other details are unavailable. 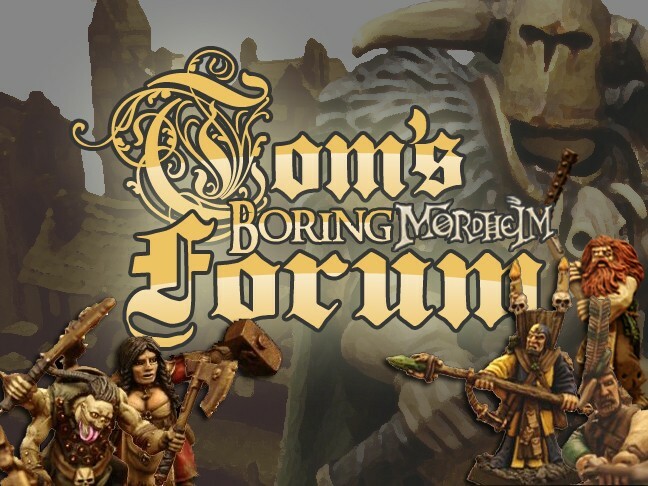 Des Hombres Rojas (warband rating 243) failed their first rout test! The Dwarf and the Moor II are killed outright. Gomez y Gomez survives. As does Guido the Tilean. Two crates were in the possession of the Hombres when they fled (neither exploded). The crates contained around 16 gc worth of food and booze. A medicine chest was found in exploration. The Bay Watch collected at least five crates out of the seven remaining (two exploded). They gain an elf cloak and the Medicine Chest in addition to the usual food and booze. OUTSTANDING! The Games board was WONDROUS to behold; BEAUTIFUL scenery & some finely painted minis...the Mary Anns are BEAUTIES. GREAT STUFF! Another mad battle on a spectacular board -- good stuff as always. My attention goes especially to the brightly coloured Marienburgers with their truly epic sleeves! Thanks for the kind comments gents! Des Hombres suffered from using rubber bullets and arrows on their opponent. The Bay Watch suffered from not having any bullets or arrows to reply with. So they made a well timed lunge for the far horizon, just as the wind shifted to their favor. The Valeria Rojas wallowed in irons as a rain squall made her cannon and harquebuses useless. The Bay Watch win by escaping. No one was even injured, let alone out of action. The Bay Watch traded with the Cheating Merchant. Des Hombres were able to use the contacts of newly hired Ali ben Ali to procure a brace of cheap but lethal dueling pistols. They were also able to trade at Torktuga despite losing the fight. The Bay Watch got rich (or at least I assume they got rich, it is hard to tell if something positive happens to Mr. L) by cashing in on their Treasure Map. In addition they found a dwarven pistol. Mostly there were complaints about the cheating merchants prices for lucky charms. The Mary Anns gained more underdog bonus and wounds suffering through three blunderbuss blasts and shark attacks. The Mary Anns retire as soon as possible. Some folks died, but not on Mab's Crew. Both warbands ended up trading with the Cheating Merchant which did nothing to improve the Mary Anns' mood. I only had 1 handgun and 1 crossbow for long range shooting so I closed as soon as possible. Chris hit me turn 2 or 3 with 3 blunderbusses. He took 5 ooa including 2 heroes. One of whom being my captain. Gunner Pops armed with my only handgun died. Both warbands trade at the Cheating Merchant (who did a land office business and may have convinced me to add more options to my Supply Chart for the Karribean...) I'm thinking Chris added at least one handgun to his arsenal after the fight (by opening a crate). The Marienburgers gained even more experience through underdog bonus. Their massed crossbows (or just the Tilean Marksman) shot poor Alma the Merchant Princess right out of the fight, but a constant rain of crossbow bolts and bullets eventually demoralized the men of the Empire. AAAAARRRGGH! That be some FINE yarns of De'ering Do. GREAT STUFF, Jim! Des Hombres gained the advantage and went first. One henchman was shot down but the range was too great for the handguns to fire. Mab replied with her crossbow and took Guido the Tilean out of action with one shot. Des Hombres needed to board to break the Crew, so they closed the distance. A cannon crew was shot overboard... Sharks! Then des Hombres had to weather the 3 blunderbuss blasts. This cost another cannon crewman (from the larboard gun). Amazingly no heroes went out of action. Gomez y Gomez and Enrico fired back! They broke the Crew and sent Mab overboard! She struck her colors before the sharks got her. None of des Hombres casualties died or were captured! Mab lost a cannon crew and a regular gunner. The gunner joined the Hombres. The cannon crew was sold to slavers for 10 gc. Both warbands traded at the cheating merchant, but des Hombres were able to add another brace of dueling pistols due to Ali ben Ali being awesome. Des Hombres got sort of rich (a hired sword payroll of 58 gc per game means they have to make LOTS of money every game...) And Captain de Guzman found the Fountain of Youth in exploration. Woot! Again I closed quickly, since I only had 1 crossbow left for long range shooting. The Mary Anns had five crossbows (and that Tilean). At edge of board I locked the ships together and made 4 charges. Shark Bait (the cabin boy) overboard! After the counter charge was over we were both hurting and with only 10 minuets left to the night I conceded. Lost my way to the cheating merchant all 3 games. The captain has no skills as yet so no haggling. With Pops dead and Moe III, the swabbie, running away my rating is up some but I’m down 2 bodies, a handgun, and 50gc. Did find a Dwarven pistol and 3 Greatcoats. The Mary Anns won, but still ended up at the Cheating Merchant. Having the sails up for the photos really makes for some cinematic reports. GREAT STUFF! These really are some beautiful looking games -- tales of high adventure! » Pyrates of the Karribean IV--Shiver Me Timbers!